Mistress of the wolves, Terry Spear is visiting with me today. The newest book in her werewolf series, Legend of the White Wolf (#4) was just released this past week. I just finished it and it was a perfect curl-up-on-the-couch paranormal romance and a mystery thriller to boot (my review) . Each book is standalone and doesn't require you to have read previous volumes in the series. Terry covers a lot of ground in this interview with peeks at upcoming books, her writing and more. Terry has donated a copy of Legend of the White Wolf to be won by one lucky entrant so if you haven't picked up this latest or tried Terry's series before, here's the perfect opportunity. Full details at the end of the post. Terry will be dropping by to answer questions, so get wolfy. Of course I get to ask my questions first... Speaking of wolves, if you haven't been following Terry's blog regularly, you should. Amazing images and discussion about real wolves almost daily. SFG: The last time we spoke you had just released To Tempt the Wolf. Your newest book in the series is Legend of the White Wolf. Can you give us an overview? In the fourth book in werewolf series, Private Eye Cameron MacPherson and forensic scientist Faith O'Malley are both on quests that lead them into the world of magical wolves, mystery and murder. Cameron arrives in wintry Maine to search for his partners in his P.I. business who are late returning from a hunting trip, and runs into Faith, there to locate her ex-boyfriend who stole her father’s research. But Cameron and Faith instantly are attracted to one another and keeping their business on a strictly professional level doesn't have a snowball's chance of succeeding in a toasty fire-warmed cabin, the couple snowbound and the setting perfect for an unplanned tryst. Canadian Arctic wolves, werewolves, that is, are introduced in this book and Faith and Cameron soon learn that not all wolves are the same. SFG: What is your favourite scene, favourite character? “Sorry, we’re all newly turned. We can’t just shapeshift any time we want to,” Faith said shrugging. “But I can shift anytime I want to,” Leidolf said, and everyone turned around to see him standing in the doorway, his amber eyes lethal. SFG: The packs in each of your books often have different characteristics. What rules and dynamics govern your werewolves? There’s nothing worse than reading a series where every book sounds like the last book, only the names have been changed. So I try to maintain the same world, but create unique packs, because in real life, every family unit would be different, just like with a pack, depending on the personalities within a pack, where they live, who’s in charge, and the outside forces that challenge them. Yet, still, the world has to basically be the same. The characters are wolves and humans combined. They’re not beasts, although the bad guys can seem that way, just like humans who are that way. They are wolves in wolf form, though have the human thought processes, yet, it’s tempered by their werewolf persona. Werewolves don’t exactly see things as full-fledged humans do, or wolves do. They can’t, because they live in secret and so they have to live amongst humans, keeping their uniqueness hidden. Those who were turned very early on and have mostly werewolf roots, no recent strictly human influences, are royals and can change at will. Everyone else is limited to changing during any moon phase except for during the new moon. If a werewolf is in wolf form and dies, he reverts back to human form. (This was a werewolf legend I kept in my stories.) Silver can kill (also a werewolf legend), and in Legend of the White Wolf you’ll learn why this is. Normally, a human can’t have a werewolf child. A werewolf in human form couldn’t turn a human into a werewolf with a bite. Normally. But as in all worlds, there are exceptions to most rules. So I’ve illustrated both of these exceptions in To Tempt the Wolf. Wolves mate for life. But on occasion, real wolves have taken a mate after theirs have died. But in one honest to goodness wolf pack, the alpha male actually had a concubine! Two females at one time!  So you see, there are exceptions to most rules, and I’ve used that in Destiny of the Wolf. I always loved Michael Crichton’s Jurassic Park and how “life will find a way.” It makes me think that no matter what we believe are the unbending rules, something can come along and change it. SFG: You use the tagline "Giving new meaning to the term alpha male." On the flipside, what kind of women do you like to match with your heroes? Women who are as strong as the hero. Not physically, though. It has to be more of a case of catching a bigger man off-guard. I had to take a little bit of hand-to-hand combat training in the army, and there was no way that a 5’4” woman could take down a 6’ guy when he knew just the move I was going to make, since they’d just taught them to us. Not unless the woman’s been trained in the martial arts, wears a couple of black belts, and the guy is clueless. In my stories, if a man needs a woman’s help, she’s there to help him. She’s often self-sufficient, but missing the romance in her life. And the same with him also. He’s strong, self-confident, although in both cases they have past emotional baggage that makes them real, but he also needs to find the mate who will make him whole. SFG: You feature some amazing photographs of real wolves on your blog. Thanks, Doug! I love analyzing wolves in the photos, trying to psychoanalyze them. SFG: How do you go about your wolf research? I read books, look for wolf sites that talk about their wolves at actual wolf preserves, watch videos on wolf behaviour. Do you have particular images you set aside for each of your characters? 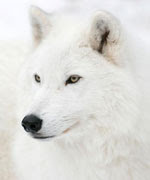 I have a favourite Arctic wolf picture I liked to look at when I was describing Cameron in Legend of the White Wolf and the same wolf as his worst enemy. To me, they were the same wolf, equal in beauty and strength, but it was their personalities and backgrounds that made them unique. I have several red wolf pictures I used to describe the red wolves in Seduced by the Wolf also. And in Wolf Fever, I studied different gray wolf colorations to describe the wolves in that story. SFG: You have a very busy year in 2010 with at least two more books in the series releasing and a highlander romance as well. How do you manage to be so productive? The vampire release, Deadly Liaisons, was an earlier project, so I just edited it some more and sent it off. With The Accidental Highland Hero, I had been writing on that for a long time, just a little here and there between sales for my wolf series. So when it was finished, I sold it as the sequel to Winning the Highlander’s Heart. But now with the contracted wolf series and working full time, I’ll probably not be able to manage much more than that for a while. What is your writing routine/day like. I work like crazy on blogs, online workshop lessons for students, sometimes get a little writing in on my current work in progress before work, then go to work, then at work, catch up on emails during my lunch hour, then come home after work and do all my morning stuff all over again. During my two days off, I write like crazy, trying to catch up on my word count for my current release and work on guest blogs due two weeks away so I don’t get behind on them. SFG: Are you a pantser or a plotter? SFG: You are obviously firmly in the werewolf camp when it comes to writing about supernaturals. Any vampires or other mysterious creatures in your future? I love werewolves!!! I also love vampires!! I do have 3 more vampire stories I need to edit, and if I can ever do that, they may be out in the future. I also have a short story vampire/sea demon romance that I had fun writing that I hope to publish some day. I am including a ghost in Taming the Highland Wolf because old castles need a ghost or two. SFG: What projects do you have coming up in 2011 and beyond? Taming the Highland Wolf is coming in the spring, which is the current work I’m writing. And Dreaming of the Wolf, which is Jake’s story from Destiny of the Wolf, and is due out after that in 2011. I’ll be working on a couple of more Highland wolf stories after that. I just need to set up my world in this one, then propose a couple of more stories to add to the Highland wolf packs. Robert Frost. I absolutely loved his Stopping by Woods on a Snowy Eve. I saw a film interview of him when I was in college and I loved his responses. I can’t write poetry, but I love to read it. I love tons of SFF stuff—Star Wars, Star Trek, spoofs on them like Galaxy Quest, Lord of the Rings, The Princess Bride, Stardust, Serenity, Jurassic Park…I could go on and on. I’ve read a couple of SF romances I thoroughly enjoyed, but don’t recall the titles. Once upon a time I took a creative writing class in junior high school and though I was extremely, extremely shy, when my teacher asked if anyone wanted to read the opening of their story, I enthusiastically raised my hand. It started out with a dark night, crossing a bridge, very ominous, spooky, moody. I loved ghost stories and vampires and all that kind of stuff. We had to cross causeways every time we left Merritt Island, Florida, and driving in the dark at night or pitch black water made me think of dark and scary things. My teacher asked if it was a true story. I said no, and felt two inches tall. It’s supposed to be a true story, she said. Got my assignments mixed up. I still loved to write. But I never read another story out loud in class. Another class story. I was extremely, extremely shy. Do you see the theme here? And if I could, I’d never, ever give a speech in class. But one day I had to. We could use props, so I figured that would help me feel less insecure. I was also taking a pottery class at the time, and though I write much better than I create with clay, I made a bust of an important figure for the speech. I had barely started when the head of my famous person fell off his neck. He rolled toward the first row of students. I laughed. Albeit a bit hysterically. Tears came to my eyes, because of the laughing. But no one else laughed. They looked horrified. My teacher looked sympathetic. I tried to regather my composure, gave my speech, chuckled a few more times, then picked up my famous person’s head and returned to my seat, vowing never to make another bust of an important figure for a prop, and praying I’d never have to give another speech as long as I lived. It didn’t work, although I never did make another clay figure! My heroic endeavour that didn’t turn out well. I stood up to a bully once and got a fist in the face for it, but I’ve always advocated standing up for one’s self, even though I was extremely, extremely shy. I swam with water moccasins in a canal, before I knew they were swimming with me. We caught them in a minnow trap, which was when we learned why no one else swam in the canal! I explored the swamp across the street, despite knowing it was probably a dangerous thing to do. Alligators, snapping turtles, water moccasins, rattlesnakes. Sure, I was shy, but I was still adventurous. Thanks millions for having me, Doug! Great questions, and I was verbose as usual. If I were speaking, I wouldn’t have talked half this much. And I wouldn’t have made a clay bust for a prop, even if it had been of a wolf! LOL. We love having you visit Terry. It been like a fireside chat at one of the lodges in Legend of the White Wolf. Leave a question or comment for Terry. Do you like your males, alpha? One autographed copy of Legend of the White Wolf available to a commenter. US and Canadian residents are eligible. Giveaway open until Midnight, February 22, 2010 EST. Why wolves? Were you also fascinated with the other paranormal creatures? "I had barely started when the head of my famous person fell off his neck. " Have you thought about trying young adult novels? I am huge paranormal romance fan...especially werewolves. I haven't had the pleasure of reading your series as yet but it's going on my Must Read list. I can't wait to start reading this series. Hi Terry and Doug! I read the first three books in this series and really liked them - I'm looking forward to this one and the next two as well, I really enjoy the world you created here. I had no idea you wrote other books so I'm off to go check those out! I haven't yet had the opportunity to read any of your books. the first ones are not available at my local book store. Can the books be read out of order, or do they follow each other and are better read in sequence. Would love to win one. Hi Terry! I love werewolves and alpha males so I'm looking forward to reading this series. Thanks so much, Doug, for the great interview, and the wonderful way in which you display guest blogs! I'm sorry I'm late to the party, but glad the word has gone out with me. We had an ice storm last night and my Internet was iffy at best, but this morning, non-existent! So this is the first I've been able to get connected. Thanks again!!! LOL, Jessica, it's been years ago, but I still laugh at myself over that one. :) I'm thrilled you enjoyed the laugh! And thanks for loving the books! Thanks, Anna Shah! I noticed your cute cat icon and I was thinking about Wolf Fever where the heroine had a cat before she became a werewolf. Who will rule the household now? The feline or the canine? Thanks for giving the series a try!!! Patti, thanks so much! I'm thrilled you love the series and I'm glad you discovered I've written some other books! I'm an eclectic reader so I love to write in lots of different genres! Hope you love Legend of the White Wolf, and thanks again!!! Thanks, tetewa! Hope you start reading it! Thanks to everyone for dropping by, and to Doug for having me! Congratulations on the release, Terry. I like alpha main characters. I will definitely have to put your books on my TBR pile. I enjoy all my books with a bit of mystery (which is what I started out with way back when). Hey, Sandy Jay, I'm glad you enjoyed the interview and hope you love the books! I love your icon of the two wolves!!! Burr!!! It's nice sitting by this fire Listening. I love Wolves especially Terry's Wolves. She has a True Gift. She makes them real. They're not Sci-fi when Terry writes the stories. I feel like I want to just lay done by the fireplace with that Hunky wolfman right now. And it's really possible. Thanks for sharing your talent with us. Hi Terry. Great interview. I love wolves. Alpha males are my favorite heroes. Great interview and I love my alpha wolves! I haven't had a chance to read your books but have added them to my TBR pile! Thanks so much, Diva Donna! I think I need glasses. I read where you said I had True Grit and I was thinking of John Wayne. LOL Yes, wolves and winter and warm fires make the perfect combination!! Thanks! Try to stay warm! Hi CrystalGB...werewolves can make terrific companions,whether in their wolf forms or human. I so agree!Thanks! If you all haven't seen the review that Doug did, check out his link in the blog! I loved it! Thanks so much, Doug! I'm glad you enjoyed Legend of the White Wolf! Terry, your books sound amazing and I am adding them to my wish list. I love alpha males, and strong, confident women - and it sounds like these are the characters you write about. I love Alpha males, there's something about that surety of their actions that makes them so alluring. I'm adding your books to my list so I hope I can find the first one soon. The wolf images you have are so amazing! Do you get a chance to use any of those for your covers? Loved the interview, Doug. Great questions. I look forward to reading The Legend of the White Wolf and I can't wait for Taming the Highland Wolf to out. I do love ghosts! I'm never disappointed with your stories. I pick up one of your books and I know I'm in for a great read--Vampires, Werewolves or Historical Scotsman. You spin some intriguing tales. my moms keeops raving about how great you are and i love reading books so i cant wait to read yours!!! Thanks so much, Karen! Doug's questions were great fun! I read the first three books in the wrong order. No problem. But it was neat to learn more about the characters, and I'm certainly looking forward to the next ones. I'm curious about how many of the characters were already in your mind when you wrote the first book. LOL, Sheila, I've read other authors' books out of sequence, and I'm always glad when I can do it, and I'm not lost. I loved your question! I only had in mind the hero, heroine and main villain, plus the kid the heroine was lusting after in the first story, Heart of the Wolf. As I write, the story grows, more characters add to the conflict, and it's done. At the end of Heart of the Wolf, my editor was upset because it looked like the red wolf pack would perish. So Leidolf became my mystery wolf. Because he had such a mysterious presence in Heart of the Wolf, I really enjoyed his character, and brought him back in each of the stories as a secondary character. Each time he has a different role to play, so it's not like anyone would HAVE to read them in order. Yet like one reviewer said, there are subtle connections, threads that have been introduced. In Seduced by the Wolf, Leidolf finally has his own story. Yayz, I am definetly eager to read these books now. And the covers are fun...mmm mmhm. Alpha male yes...pushy and bossy no. I'm eager to read your books. Have you tried writing young adult fiction? I think you would be a good match with it. I like your alpha males. I've enjoyed the books I've read and looking forward to reading Legend of the White Wolf. Posted to Facebook & Twitter. Thanks so much, Andrea! I hope you love Legend of the White Wolf! Good luck! Hi Terry. I love reading your Destiny of the Wolf. I love alpha males. They just give the aura of security and strength. Thanks for stopping by. I would love to win the next book on the series. What was it that brought wolves to your attention? And whats your favorite thing about you werewolves? Shoot i forgot to put my extra entry. Leilani, a vampire girl, eh? You'll have to check out Deadly Liaisons where my vampires shift into wolves when they want to. :) I fell in love with wolves with Jack London's Call of the Wild and White Fang. I wanted to see both wolves and man survive in peace and harmony. What I love most about werewolves is their pack mentality--taking care of each other, playing and hunting together, how they're family- oriented, and mate for life. Hope you give them a try!